This is where it all starts, the Stanley Rule and Level Company's first plow plane offering. The Industrial Age was getting into full swing, old materials were being used in way's never dreamed of before. The ability to mass produce quality interchangeable parts meant better products at cheaper prices, but first one had to overcome the centuries of tradition that pervaded the crafts trade in the 19th century. 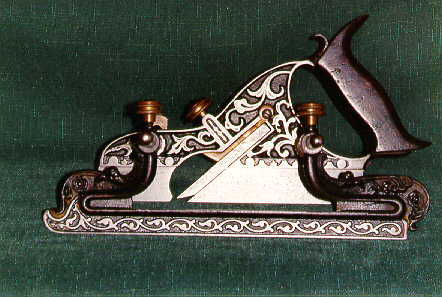 Plow planes (virtually all planes) were made of wood with few metal parts and getting the craftsmen to change to the new medium was difficult. 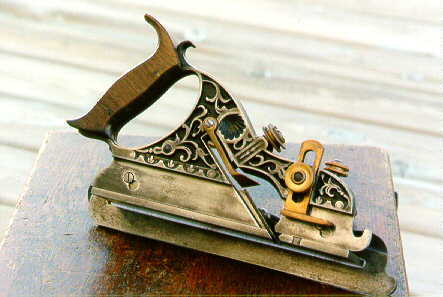 One way to overcome this adversity to change was to adorn the tools with intricate designs and colorful painted accents, and that's where the Miller's Patent Plane comes into the picture. The number designation of these planes was not established till somewhere around late 1871 . The July 1, 1872 pocket catalog is the first printing I am aware of that lists the planes with a number assigned to them. Prior to that date the plane was listed as available with a "Gunmetal stock and Gauge" or "Cast Iron Stock and Gauge" and either with or without the filletster bed. The #41 combined plow, match and filletster plane. Note the distinctive curve of the body terminating with a "hook" at the tote. The fence screws and cutter clamp locking screw are of two piece construction. A brass thumb screw with 3 knurlings and a steel round headed screw through the center. 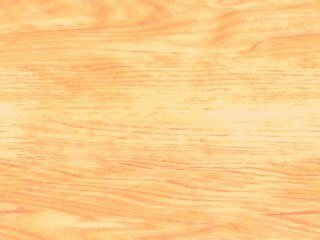 The tote is secured with two pins, the tips of the tote are long and curve gracefully. The filletster cutter slot extends all the way through the top of the cutter. The cutter clamp chip deflector is brass, the deflector portion is shorter than in later models. 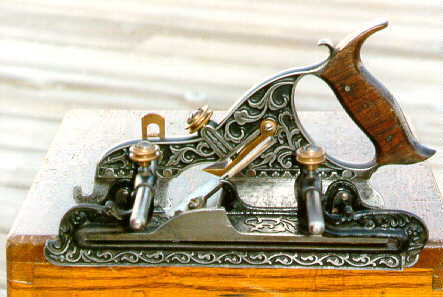 Looking at the right side of the plane you will note the distinctive shell design cast into the body (just above the cutter clamp). You can also see the "bead" that surrounds the threaded hole of the depth gage locking nut. 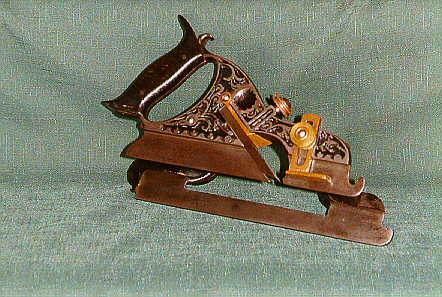 Planes of this vintage carry the football shaped trade mark on the skate, stamped "Stanley Rule and Level Co." with a serrated border. Here you can see the heads of the screws that hold the filletster bed to the skate, the cutting spur on the filletster bed is also visible. In this view the filled in slots of the fence are clearly visible. A key point of the patent issued to Charles Miller makes note of the removable filletster bed. The models 43 and 44 do not carry this feature, it is fair to assume that since they did not match the language of the patent, the patent stamp on the tote was not applied. The other possibility is that royalties were paid for use of the patent to Charles Miller. Since these two planes did not apply directly to the patent feature, the stamp was omitted and royalty payments were avoided. This patent stamp is found on all models that have the removeable filletster bed. On the models with two pins holding the tote it will be found on the left side of the tote centered between the two pins. On planes with on pin holding the tote it will be found above the pin. Pick A Type, Any Type !